According to Keyhole, #2018GAAW had 2,480,532 impressions on Twitter, Facebook, LinkedIn, and Instagram! To ensure our messages made it across the globe, we once again decided to join forces with McOnie, a specialist PR agency with expertise spanning the occupational health, manufacturing and industrial markets. Working in these sectors for over 25 years, they are all too aware of the true dangers of asbestos – the costs to society, the devastating effects on the individuals and families affected, and the startling fact that despite all of this, asbestos remains legal in an estimated 70% of countries around the world. ADAO developed communications materials that encouraged a worldwide call to action. The “Asbestos: One Word. One Week. One World.” message supported information including key World Health Organization (WHO) statistics highlighting 300 deaths globally every day from an asbestos related disease. The team engaged with international networks to ensure the press release was translated into six languages —English, Spanish, French, Hindi, Italian, Portuguese and Russian — for international distribution. In addition to widely distributed press releases, we partnered with artist and activist Firdaus Kharas and featured Public Service Announcement videos is six languages which captured the tragic reality about deadly asbestos as seen in “Asbestos: The Killer You Can’t See” || “Asbesto: El asesino que no puede” || “Асбест: убийца, которого вы не видите“ || “एस्बेस्टोस: द किलर आप देख नहीं सकते” || “Amianto: O assassino que você não pode” || “L’amiante: le tueur que vous ne voyez pas”. 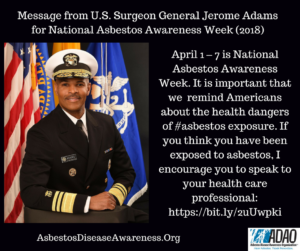 We would like to thank the Surgeon General, Honorable Vice Admiral Jerome M. Adams, M.D., M.P.H., for responding to the Senate’s request by tweeting and raising awareness about the dangers of asbestos to his 508,000 followers! 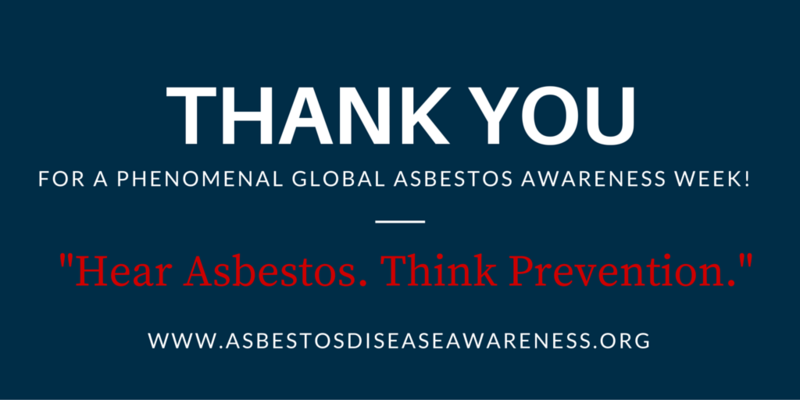 We would also like to give a special thanks to all of our Global Asbestos Awareness Week Ambassadors; day one: Mavis Nye, day two: John Panza, day three: Daniel Pineda González, day four: Heather Von St. James, day five: Mike Mattmuller, day six: Sara Babin, and day seven: Remembering Lou Williams. Without all of their incredible advocacy and strength, our message would not be as powerful or important and we thank you all for being a part of the fight. As I reflect on the success of #2018GAAW I am both amazed and encouraged. I am amazed at how far the core messages of GAAW and ADAO were communicated worldwide and encouraged to see tangible results from our combined efforts, highlighting that what we are doing is for a purpose and really is working. More people then ever have truly heard our messages and more importantly, have recognized the importance in sharing them. In the US, the Senate unanimously passed the 14th annual resolution to establish a National Asbestos Awareness Week, held in conjunction with GAAW during the same week. As the sun set on GAAW, we gathered on Friday to light a candle of hope, remembrance, and strength as we began the 14th Annual Asbestos Awareness and Prevention Conference in Washington DC. In total, there were nearly 40 conference presenters from around the world and a candlelight vigil at the end to honor and support those touched by the disease. We had the lovely opportunity to be together for the conference on Day Seven of GAAW and light a candle as a unified group. The global reaction to GAAW ’18 has been truly remarkable, and we have created worldwide conversations on asbestos dangers. Our 2018 mantra “One Word, One Week, One World” has been realized and more people than ever are aware of the efforts of ADAO. How will this ever be achieved? With collaborative efforts that unite the world with one simple message – HEAR ASBESTOS. THINK PREVENTION. If we continue to take action together, we will achieve! Each of you who shared your story, the stories of other Warriors, and shared our educational resources — you made this happen and are the biggest part of the solution! On behalf of ADAO, I want to sincerely thank Sarah McOnie and her amazing team for supporting ADAO and GAAW for allowing us to take this message and week to a wider global audience. McOnie is absolutely incredible and enormously talented, two of their many qualities that ensure success. We look forward to continuing the Global Asbestos Awareness Week conversation in 2019. Until then, remember — asbestos awareness must be more than the focus a day or a week — it must be a mantra. This entry was posted in Blog and tagged #2018GAAW, ADAO, asbestos, Asbestos Disease Awareness Organization, GBAN, Global Asbestos Awareness Week, Global Ban Asbestos Network, mesothelioma, social media, twitter, United States, Worldwide. Bookmark the permalink.